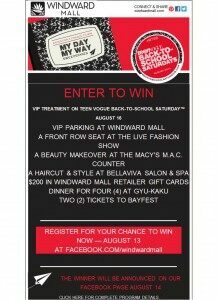 Teen Vogue Back-To-School Saturdays™ (BTSS) is a galvanizing moment designed to motivate and inspire consumers to get out and shop for the best of back-to-school fashion, beauty, and more. BTSS is a multi-platform initiative involving all of Teen Vogue’s assets in print, digital, social, mobile and event marketing. Participating JLL-managed centers across the country will be hosting BTSS events August 9, 16, 23 and 30, providing the perfect opportunity to join forces with their retailers to position the centers as THE back-to-school shopping destination in their local markets. The teen-oriented events at JLL-managed centers will feature retailer sales promotions, entertainment, fashion shows, music, food and giveaways. This year, back-to-school spending is expected to generate approximately $74.9 billion in sales, according the National Retail Federation (NRF), making it a critical time for shopping centers to capture sales. Despite recent concerns that online sales would dominate the back-to-school season, it appears that shoppers favor bricks-and-mortar locations. The International Council of Shopping Centers (ICSC) expects approximately 9 of 10 households will select bricks-and-mortar retail as their back-to-school shopping venues, and events like Teen Vogue Back-To-School Saturdays™ are a great way to enhance the shopping experience for consumers. To further enhance the shopping experience in their bricks-and-mortar locations, JLL developed a complementary My Day, My Way social media promotion to award lucky shoppers with a VIP experience at their local BTSS events. For example, the VIP prize package at Rosedale Center in Roseville, Minnesota,will include a makeover (haircut, style, color and makeup), a one-hour $250 shopping spree in a store of the winner’s choice and two round-trip airline tickets on Spirit Airlines. Central Mall in Fort Smith, Arkansas,will offer their VIP winner a limo ride to the BTSS event, $400 in retailer gift cards, a beauty makeover by MAC Cosmetics, dinner at a Central Mall restaurant and a sweet treat from Dairy Queen.